The crust is here, the original recipe is there, and the fruit comes from everywhere, in particular the peach tree in my backyard. The whipped cream dominates the image above for a reason: it’s the secret to this tart’s success. I had five friends over for an early Sunday dinner in mid-summer. Continuing my project of diminishing my supply of lamb in the freezer, I grilled a butterflied leg of lamb according to the Gourmet Cookbook’s instructions. When the lamb reached the right temperature, I replaced it on the grill with unshucked ears of corn. I put on the lid with the vents partially close to diminish the fire slowly so that the husks didn’t catch fire but the corn would cook. The lamb rested for the twenty minutes or so it took for the corn to finish. A tomato-cucumber salad finished off the dinner. For dessert, I decided to improvise. That morning, I picked up a flat of crimson red strawberries and a small container of blueberries. The day before, I had picked a few peaches off the tree in my garden. I wanted to make a fruit tart whose constituent flavors stood out sharply from one another, so I decided to forgo the risk of a goopy pie. No cornstarch, as the one recipe called for; no crème anglaise custard, as the other required. I decided on Dorrie’s Good-for-Almost-Anything-Pie Dough, sliced fresh fruit with only sugar and lemon, and the whipped basil-infused cream and mascarpone from a Martha Stewart recipe. I admit I’m just enough of a snob to feel slightly abashed at posting a Martha Stewart recipe. But snobbery never pays. One post in the near future will involve her excellent cookbook for hors-d’oeuvres. The recipe I’ve adapted here came to me from a friend who’s a very good cook. Lynda brought the strawberry tart with the cream to a dinner we both attended. Everyone gushed over the unusual flavor of the basil-infused cream in combination with the strawberries. Yesterday, I wondered, “if basil works with strawberries, will it work with peaches?” Now I can say, yes, and I think everyone at my dinner last night would agree. So, here’s the tart as I made it. Follow the link above for the complete strawberry galette. After the pie dough cooled, I spread Damson plum jam on the surface of the crust (apricot jam would work very well, too). Then I crushed two graham crackers and sprinkled it over the jam. Martha’s recipe calls for adding corn starch to the strawberries, which didn’t appeal to me. Dorrie’s strategy of dusting the bottom of fruit pies and tarts with graham cracker crumbs to soak up fruit juices makes a lot of sense to me. I sliced the strawberries as Martha’s recipe described: cut off the tops and the tips, and slice the remaining berry into 3 cross slices for round pieces. I put the slices in a bowl, sprinkled them with lemon juices, sprinkled 1 tablespoon of sugar over them and mixed it all together. Then I thinly sliced the peaches and add them to the strawberries slices with additional lemon juice and another tablespoon of sugar. I mixed in blueberries. Pressed for time, I eschewed arranging the fruit in a pattern and simply poured all the fruit into the partially baked crust. I liked the riot of color of the jumbled fruit. I put the tart on a baking sheet and baked it in 350 oven until the fruit started to caramelized just a little, about 40-45 minutes. I thought of turning up the heat, but the crust would have turned dark and hardened. Let the tart cool a bit before serving with the cream. 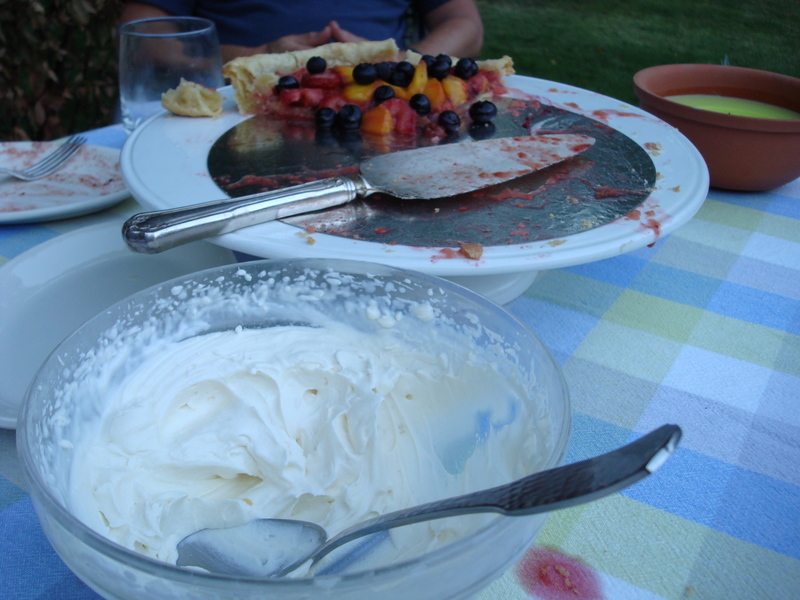 Everyone agreed the two noticeable benefits of this tart were the cream and the unadorned fruit with distinct flavors. You can’t get much more seasonal than this dessert. It is only possible when at the height of the fruit season.